Unless you qualify for a special exception, you must get health insurance during open enrollment. Companies usually have their open enrollment in the fall or winter; check with your employer for the exact dates. For plans through the Affordable Care Act, also called Obamacare, open enrollment starts in November. You can enroll in Medicaid or the Children's Health Insurance Program (CHIP) any time of the year if you are eligible for those programs. See if you are eligible in Medicaid or CHIP. Medicare open enrollment is Oct. 15-Dec. 7 each year. Information for health plans and prescriptions plans are usually sent for Medicare at the beginning of October. You don't have coverage through your employer or your spouse's employer. You are older than 26 and can't be on our parents' health insurance anymore. If you're a veteran or you're eligible for Medicare or Medicaid, you do not need to sign up. Note: You also are not required to have health insurance -- and won't have to pay a fee -- if you don't file taxes because your income is below the tax filing threshold or that coverage would cost more than 8% of your household income. During open enrollment, you can renew your current health insurance. You may not have to do anything if you want to keep what you have. But your current plan may be changing. Watch the mail for a letter about any changes your plan intends to make in 2018. If the changes aren't acceptable to you (your doctor is leaving the network, for example, or your drugs won't be part of its list of covered medications), you will want to look for a plan that better suits your needs. If you need to switch, open enrollment is the time. You may want to sign up on the marketplace exchange in your state if you qualify for tax subsidies to help you pay your premiums. Qualifying depends on your family size and income. To qualify, your family income must fall between 100 and 400 percent of the federal poverty level (FPL). Based on this formula, for instance, for 2018 coverage for a family of four, the income bracket is $24,600 to $98,400. Otherwise, if you want, you can sign up for health insurance directly through a plan during open enrollment. If you get your health insurance through your employer, the open enrollment period for the government-run marketplaces and Affordable Care Act plans won't affect you. 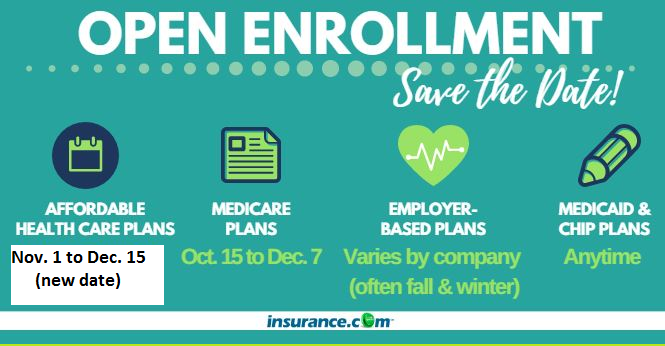 You need to sign up for coverage during your employer's open enrollment period. Some employers will automatically renew the plan you had this year. Others require that you sign up each year during its open enrollment. Ask your employer its rules so you know what you have to do. The same advice to watch for changes applies. If you are enrolled in Medicare and want to make a change in your plan – such as switching to Medicare Advantage (Part C) or adding prescription drug coverage (Part D) – you must sign up during its fall open enrollment period. Medicare open enrollment is Oct. 15 to Dec. 7, and coverage starts Jan. 1. Again, open enrollment for the government-run marketplaces would not affect you. The amount of money that you must pay out of pocket when you use health services goes down with the metal level. Bronze plans will have the highest deductibles and copays while platinum will have the lowest. However, the premiums for the bronze plans will be the lowest and premiums will be the highest for platinum. When deciding what's the best plan for you, think about your health and your family's health -- and financial situation. Do you see a doctor or other health-care provider regularly to help you manage a chronic disease or condition? Do you take costly medications? You may want a health plan that has lower copays and deductibles if you are a frequent user of services. If you are young and healthy and use few medical services, you may want a plan that costs less in premiums. Of course, you never know what can happen. And you can't change your plan outside open enrollment just because something happened to you. Look at the out-of-pocket-maximums for the plans you're considering. Could you afford that amount should the unexpected happen? Check out the doctors and hospitals in the plan's network. Are the doctors and hospitals you prefer part of it? Some plans will only pay for those providers in their networks. Some plans will pay if you go to providers who are out-of-network, but at a lower rate than for in-network. The plans are required to provide a list of drugs that they cover. The list is available on their websites. Check it out if you take medications to manage any conditions. See what you would pay in the different plans you are thinking of enrolling in. It may help you to compare if you make a spreadsheet. 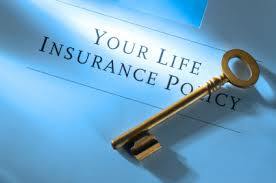 Insurance plans can offer benefits in addition to the required benefits. The best way to find out what benefits each plan covers is to go to its website and compare. What if you don't want health insurance? If you don't sign up for health insurance during the open enrollment period, you may have to wait an entire year to sign up. If you don't have health insurance, you could be subject to penalties at tax time. If went without health insurance in 2017, the penalty is 2.5 percent of your income or $695 per adult (whichever is more) and the penalty for each child in the family without coverage will be up to $347.50. The maximum penalty is set at $2,085. For the 2018 tax year and beyond, the penalty will remain at 2.5 percent, but the flat and maximum amounts will adjust for inflation. The penalties would be subtracted from any income tax refund you were due. If you voluntarily drop your coverage, you won't qualify for a special enrollment period. The only time you can re-enroll is during open enrollment. If you apply for a special exception and are rejected, you can appeal the decision to the Health Insurance Marketplace. What's the difference between an HMO, PPO, HDHP, EPO and POS? Find out here. If you experience system errors when signing up, you may be able to work with a caseworker to resolve your issues and have the deadlines extended. You also may not be required to buy health insurance if you apply for Medicaid and are rejected because your state did not expand eligibility. Also, members of recognized religious sects that have religious objections to medical insurance may be excused. If you live abroad for most of the year (330 days), you are not required to buy insurance during open enrollment either. HealthCare.gov has a list of important marketplace deadlines and information about eligibility. You also can sign up to get emails about new health insurance options and benefits.